Some health problems are more common among people with Down syndrome than among the general population. However, given knowledgeable and well-resourced medical care, most of these can be successfully treated or managed. 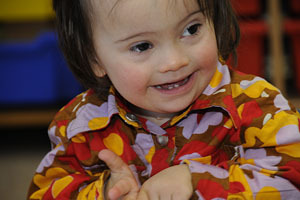 Virtually all of the health issues that occur in people with Down syndrome also occur throughout the wider population. 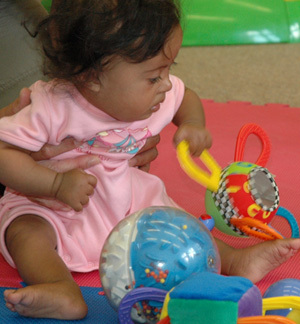 Therefore, general advances in medical care for all children and adults have also benefited those with Down syndrome. General medical advances and equal access to them are the main reasons for the increased life expectancy observed for people with Down syndrome in developed countries. Supporting these improvements are evidence-based, preventive medical care guidelines. There are specialist medical interest groups established in the UK and Ireland and in the USA that provide evidence-based healthcare guidelines. In the US, medical care guidelines are also issued by the Committee on Genetics of the American Academy of Pediatrics. Respiratory infections are more common among people with Down syndrome, especially during the first five years of life. Infections of the skin and the bladder also tend to be common. There is evidence that people with Down syndrome have this increased susceptibility to infection because their immune systems have some abnormalities, though the mechanisms involved remain unclear. Heart defects occur in around 47% of individuals with Down syndrome and 10 to 15% of babies with Down syndrome have a severe heart defect that requires surgical intervention during the first few months of life. The ability to repair major heart defects has had a major impact on infant survival for children with Down syndrome in countries with appropriate facilities and expertise. Almost all babies with Down syndrome who have a severe heart defect would die by school age without modern cardiac surgery. With early surgical intervention, 80%-90% of these infants survive beyond 5 years of age. Children with Down syndrome have a 10 to 20 fold increased risk of developing leukaemia. The cumulative risk for leukaemia by the age of 5 years is around 2%. Many children with Down syndrome and acute leukaemia can be successfully treated with appropriate treatment. Thyroid disorders are more prevalent among individuals with Down syndrome. The exact extent and mechanisms of thyroid abnormalities, effective screening regimes and treatment approaches remain an area of active research and debate. Once diagnosed, hypothyroidism can be simply and effectively treated, though this treatment and further monitoring is required throughout the individual's life. Up to 80% of children with Down syndrome experience hearing loss, sometimes severe. Even mild hearing loss will lead to difficulties in speech and language development. A number of factors have been identified as contributing to hearing loss among people with Down syndrome, including increased incidence of chronic ear diseases, partly due to anatomical differences and also exacerbated by weaker immune systems. Common problems include wax in the external ear canal, conductive loss due to 'glue' in the middle ear, middle ear infections and sensori-neural hearing loss. Hearing is vital for mental development and learning, especially for the development of speech and language and social skills. Although a mild hearing loss is not usually considered serious in other children, it may have a significant effect on learning for children with Down syndrome. While 'glue ear' may only lead to mild or moderate hearing losses (30dB to 60dB) this will make hearing and discriminating words much more difficult for children learning new words (for example, “cat”, “hat”, “mat” and “sat” may all sound like “a”). Hearing loss will also interfere with the accurate perception and subsequent production of speech sounds. In other words, hearing loss will delay vocabulary acquisition and compromise clear speech. A variety of interventions are now available to treat or ameliorate the effects of hearing loss. Where children are having difficulty earning to talk because of hearing loss, signing may also help. However, there are potential complications associated with some treatments and longitudinal studies examining long-term developmental outcomes are required to investigate overall benefits. People with Down syndrome are more likely to experience vision disorders such as short sightedness, long sightedness and astigmatism. They are also more likely to have squints and to experience delays in developing effective focusing, depth perception and sharpness of vision. Many of these problems can be corrected to give good vision with the use of spectacles. Studies have reported a high incidence of sleep disturbance among children and adolescents with Down syndrome. Poor sleep can lead to behaviour problems and impair learning. Unfortunately, we do not understand enough about diagnosing or treating sleep problems in children with Down syndrome. Although physiological indications associated with Alzheimer disease are present at death in almost all people with Down syndrome over the age of 30, the observed prevalence of dementia of the Alzheimer type varies widely. Recent population-based studies of adults with Down syndrome have observed Alzheimer-type dementia in approximately 10% of those aged 40 to 49 years and 26% of those aged 50 and over. Although most people with Down syndrome do not have psychiatric or neurobehavioral disorders, there is an increased prevalence of behavioural, autism-spectrum and attention deficit disorders among young people with Down syndrome. One study has suggested that the incidence of autism spectrum disorders among children with Down syndrome may be as high as 7% compared with less than 1% in the general population.